Written by Dr. Lekshmi Rita Venugopal and medically reviewed by iCliniq medical review team. Heartburn or pain in the chest or upper abdomen, which is more pronounced, on lying down with a full stomach. A shortness of breath or asthma-like symptoms. Persistent vomiting, difficulty and pain during swallowing, weight loss, and dark stools. A diet rich in fatty, sour, spicy and citrus foods. Eating large portions of food in a single meal. Connective tissue disorders like scleroderma. A hiatal hernia: the upward outpouching of the stomach through the diaphragm. The management of GERD includes a combination of medications as well as diet and lifestyle modifications. Avoid spicy, fatty, and fried foods as well as chocolates and carbonated drinks. Avoid citrus-containing foods like tomatoes, oranges, and fruit juices. Eat multiple small portions of food rather than three large meals. Have your dinner at least two hours before bedtime, so that your stomach is light before you go to bed. Elevate the head end of the bed by placing wooden blocks under the bed post. Using extra pillows will not provide relief. Avoid cigarette smoking and alcohol consumption. Medications that will help are antacids. They neutralize the stomach acid. H2 blockers block the action of histamine in the stomach cells, and proton pump inhibitors decrease the stomach acid production. Endoscopic, laparoscopic or open surgical procedures are indicated for GERD if it does not respond to treatment, or in the case of a severe erosive esophagitis, Barrett's esophagus, esophageal adenocarcinoma or associated hiatal hernia. Symptoms that are persistent or progressive despite appropriate medical therapy. Dysphagia (difficulty in swallowing) or odynophagia (pain during swallowing) or persistent vomiting. The evidence of gastrointestinal bleeding like black discoloration of stool or hematemesis (vomiting of blood). Symptoms of anemia like dizziness, fatigue, palpitations, etc. Screening for Barrett’s esophagus in high-risk patients. White men above 50 years of age, a positive family history of Barrett’s esophagus or esophageal adenocarcinoma, prolonged reflux symptoms (persisting for five years or more), persons with a smoking habit, and obesity. Placement of pH monitoring, manometric studies to confirm the diagnosis when an adequate response is not obtained from the treatment. Before doing an anti-reflux surgery. Erosive esophagitis -Inflammation and erosion of the esophageal epithelium due to acid damage. Appropriate management of GERD can prevent the development and progression of erosive esophagitis. Esophageal stricture - Strictures are caused due to a scar formation during the healing process of erosive esophagitis. 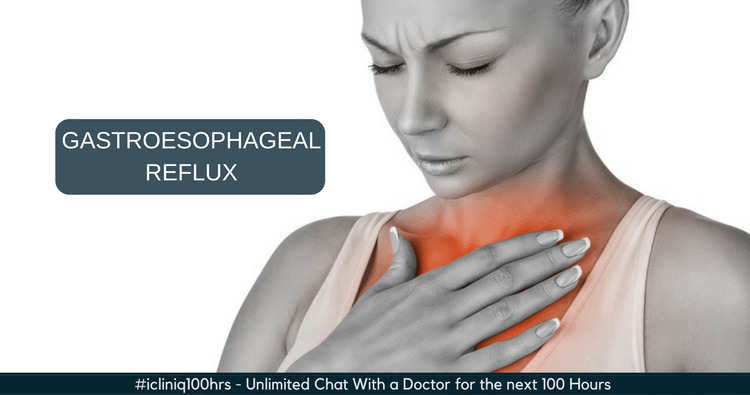 Such strictures cause a block in the esophagus resulting in difficulty in swallowing, pain during eating and persistent vomiting. It is treated with endoscopic dilation of the stricture. Barrett's esophagus - Barrett's esophagus is the change of esophageal epithelium from a stratified squamous type to the columnar epithelium type with glandular cells. This change in epithelium occurs due to an acid damage. When dysplastic or precancerous changes occur in Barrett's esophagus, it acts as a precursor for esophageal cancer (adenocarcinoma). GERD patients with risk factors for Barrett's esophagus will require an endoscopy and biopsy to assess the degree of damage and change in the epithelium and the presence of dysplastic cells which are precursors for adenocarcinoma. Depending on the endoscopy and biopsy findings, further management is by either serial endoscopic surveillance, endoscopic ablation with laser, radio frequency, or cryotherapy. An endoscopic mucosal resection or surgical resection is done if found to be positive for cancer cells. Esophageal adenocarcinoma - Dysplastic changes occurring in Barrett's esophagus act as a precursor for the development of adenocarcinoma. So, it is essential to appropriately manage GERD, prevent the development of Barrett's esophagus and carry out an endoscopic evaluation and surveillance in high-risk patients. Do you have a question on Gerd or Heartburn? What is the reason for heart burn for four months? I feel like something stuck in throat. How to get rid of this? How can I treat the pain a little left under my Adam's apple?